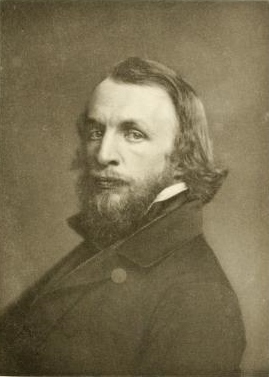 Charles Loring Brace was founder and secretary of the New York Children’s Society, the organization on which the Children’s Union of Pennsylvania was modeled. Brace was twenty-nine years old when this photo was taken in about 1855. 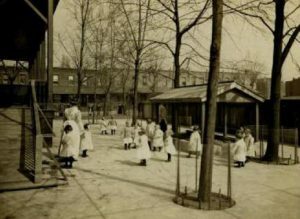 From 1873 to 1942, the Philadelphia Home for Infants provided shelter for children under age three, deemed too young to live in care homes with older residents. The children in this undated photo exercise outside the home at 4618 Westminster Avenue in West Philadelphia. According to a 1903 directory of charitable institutions, the Home for Infants could accommodate up to fifty children. The home, beset by financial problems, merged with the Children’s Bureau in 1942. 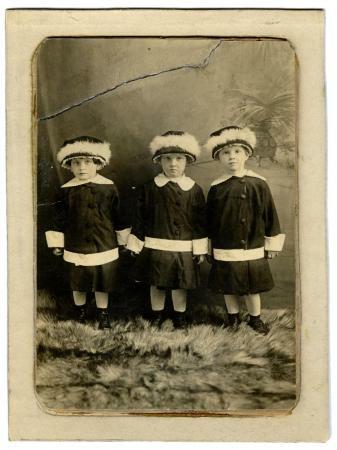 Three residents of the Philadelphia Home for Infants pose in unisex formalwear, their stance cushioned by a furry rug. The home operated from 1873 to 1942. Now considered a social work pioneer, Dr. Jessie Taft was born in Iowa and obtained her master’s and doctoral degrees from University of Chicago. Professional barriers to women prevented her from teaching in higher education, so she turned to social work, a profession more open to her gender. 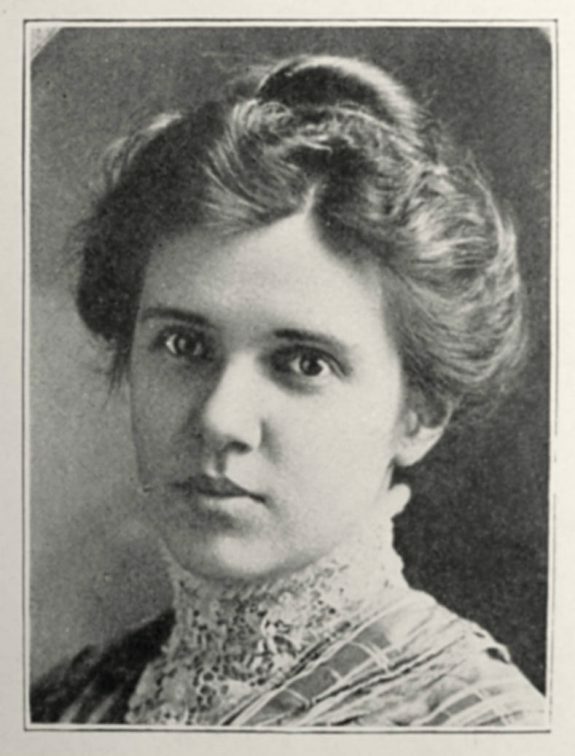 The psychologist, feminist, writer, and educator was a prominent progressive era reformer who exerted a profound influence on social work in its formative years. She became an authority on child placement and pioneered a therapeutic approach that focused on helping patients solve everyday problems. After graduating, Taft worked in upper administrative and counseling positions at the New York Reformatory for Women, State Charities Aid Association of New York, and Cornell Clinic of Psychopathology. She went on to head the Seybert Institution’s Department of Child Study at the Pennsylvania School of Social Work. In charge of children awaiting the Children’s Bureau of Philadelphia to place them in foster homes, Taft became an expert at psychological testing and the burgeoning field of mental hygiene. She trained other mental health workers at the Children’s Bureau after the school closed. Taft and her lifelong companion, Virginia Robinson, also a social worker, adopted a child of their own. Taft became the leading theorist of the “functional” school of social work, which focused on diagnosing mental illness and tracing it to its sources. Taft became a professor at the Pennsylvania School of Social Work in 1934, the year before the school became affiliated with University of Pennsylvania. In addition to teaching, she edited several issues of the school’s journal of social work. Taft retired in 1952 and died in 1960. 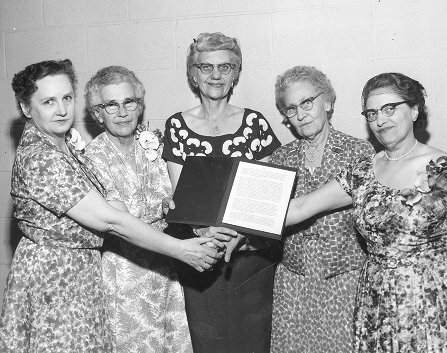 In this photo, School of Social Work faculty at University of Pennsylvania stand with Dr. Jessie Taft (second from left) following a presentation of special citation to her in 1959. Taft, a prominent progressive era reformer who exerted a profound influence on social work in its formative years, became an expert at psychological testing and the burgeoning field of mental hygiene while in charge of children at the Children's Bureau of Philadelphia. She began teaching at the Pennsylvania School of Social Work in 1934, the year before the school became affiliated with University of Pennsylvania. John Prentice Murphy was among the first social workers to create models of intervention and outcome assessment in his field. He left the University of Pennsylvania before graduating in 1908 to work for the Children’s Society of Philadelphia. He served as executive secretary of the Children’s Bureau of Philadelphia from 1911 to 1920. In recognition of his accomplishments, University of Pennsylvania awarded Murphy an honorary bachelor’s degree in economics in 1934. 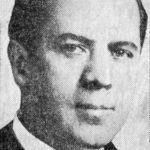 This portrait is from a news clipping, around 1920. The Union Temporary Home was established in 1856 specifically for poor white children. 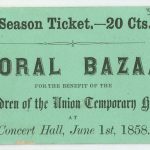 The institution held events such as floral bazaars to raise money for the children it housed, but fund-raisers weren’t enough to keep it going—the home officially closed in 1887 due to financial constraints. The Children’s Aid Society of Pennsylvania was founded in 1882 by a group of predominantly women volunteers to address social issues plaguing the city of Philadelphia, such as drunkenness, child homelessness, and rampant crime. Child welfare advocate Helen W. Hinckley led the charge, assisted by Cornelia Hancock (1840–1928), who had volunteered as a nurse in the Union army. The society’s primary goal was to support families, especially single or deserted mothers. It encouraged self-reliance by urging parents to contribute to their children’s expenses and by temporarily alleviating the burden of childcare so that they could find work. On occasion, the agency cared for abandoned, delinquent, or orphaned children. 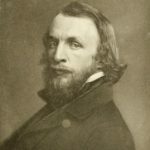 The Children’s Aid Society of Pennsylvania drew on the model of the New York Children’s Aid Society, created by Charles Loring Brace (1826–90) in 1853 to address similar concerns. The nineteenth century experienced a significant increase in urbanization, industrialization, and immigration. 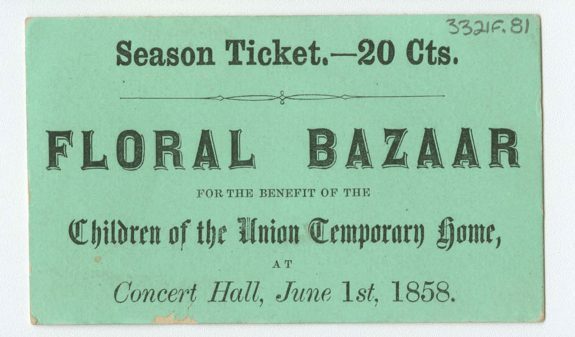 The population of Philadelphia tripled between the years 1790 and 1830, and this growth coincided with epidemics of cholera, yellow fever, and typhoid fever, which contributed to an abundance of children who were either orphaned or abandoned. As a result of such upheaval or parental neglect, children often roamed the streets, worked as apprentices through indenture, or faced confinement to almshouses, jails, or insane asylums. The combination of crime and abandoned street children presented serious issues that social welfare advocates such as Hinckley, who had previously served as secretary at the Pennsylvania Homeopathic Hospital for Children, could not ignore. 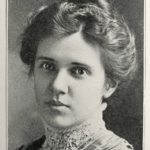 In 1883, she successfully pushed for legislation that prohibited the institutionalization of children in asylums designated primarily for adults. 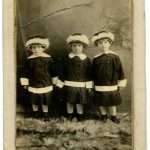 In 1884, the Children’s Aid Society reported that it had cared for 681 children annually, a number that grew steadily over the next fifty years. The Philadelphia-based organization served children throughout the state until 1889, when the Children’s Aid Society of Western Pennsylvania was organized. Since the Children’s Aid Society could not accommodate all children in the region who were in need of homes and services, volunteer committees created local county branches to respond to this need. Although initially created to address an overflow from the central office, county offices became essential to operations by the 1890s. Before the creation of a centralized bureau in 1921, these local agencies reported between half and two-thirds of the cases to the central office, many of whom were children who had been contracted as indentured workers. 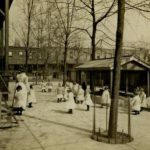 By the mid-1930s the Children’s Aid Society reported that it provided care and services for 3,030 children annually from both Philadelphia and its neighboring counties. The Children’s Aid Society was a pioneer in the professionalization of the field of social work during a period when foundations were established to tackle the root causes of poverty. In the first decade of the twentieth century, the field of social work evolved to include more scientific-based understandings of poverty and child development. In response to these developments, in 1908 the Children’s Aid Society began offering career training to its employees, which eventually grew into the University of Pennsylvania School of Social Work (later the School of Social Policy and Practice). The society itself also became more professional, with several prominent figures serving in managerial capacities. 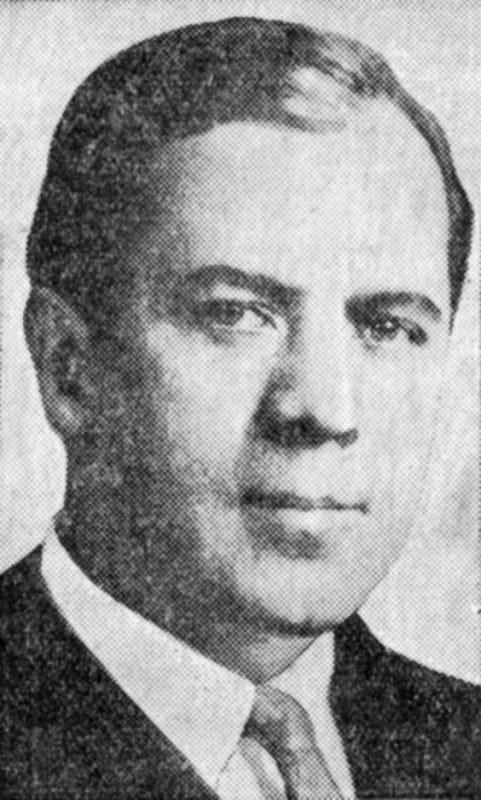 Edwin D. Solenberger (1876–1964), a social service administrator, served as general secretary from 1907 until 1943. John Prentice Murphy (1881–1936), a pioneer in the literature on the models of intervention and outcome assessment, joined the society in 1908. In the 1920s, Dr. Jessie Taft (1882–1960), an expert in the burgeoning field of mental hygiene, became the director of the Child Study Department, which provided mental examinations to incoming children. These advancements contributed to the agency’s mission by providing holistic care and support to children and their families. Over the years, several local child welfare agencies merged with the Children’s Aid Society. The Union Temporary Home (1856), an institution that was created specifically for poor white children, officially closed in 1887 due to financial constraints. The Philadelphia Home for Infants (1873), created for children under the age of three, also began struggling financially in the early twentieth century and eventually merged with the Children’s Bureau in 1942. The Children’s Bureau (1907) functioned as a shelter and centralized information bureau to funnel information to the more than sixty agencies that received needy children. During World War II, both the Children’s Bureau and the Children’s Aid Society helped place juvenile refugees from Europe into homes in the Philadelphia area. They merged into one organization in 1944. From the 1950s through the late 1970s, child welfare services were typically self-contained units that focused on in-home evaluations. From the 1970s onward, local government agencies began operating under federal legislation. Similar in its mission to the Children’s Aid Society, the Adoption Assistance and Child Welfare Act of 1980 aimed to serve children in their own homes, prevent external placement, and facilitate the reunification of families. Despite such reform, the late 1980s and 1990s experienced increases in child neglect and foster placements. In Philadelphia, agencies such as the Philadelphia Task Force for Children at Risk, the Support and Community Outreach Program, and PhillyKids Connection addressed these concerns. 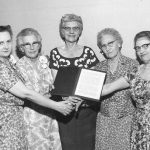 Dedicated to improving and protecting the lives of children, the Children’s Aid Society of Pennsylvania was a pioneer in child welfare and advocacy. In 2008, it merged with the Philadelphia Society for Services to Children and formed Turning Points for Children, an organization dedicated to reducing child abuse and improving the lives of over nine thousand children and their caregivers. Like its predecessor, Turning Points for Children focused on providing holistic family-center programs in the interest of building community relations in the region. Holly Caldwell received her Ph.D. in history from the University of Delaware, where she wrote her dissertation on the medicalization of deafness and deaf education reform at Mexico’s Escuela Nacional de Sordomudos (National School for Deaf-Mutes). She is an Adjunct Assistant Professor of History at Chestnut Hill College and has also taught at Susquehanna University. Brown, Dorothy M. The Poor Belong to Us: Catholic Charities and American Welfare. Cambridge, Mass. : Harvard University Press, 1998. Crenson, Matthew A. Building the Invisible Orphanage: A Prehistory of the American Welfare System. Cambridge, Mass. : Harvard University Press, 2001. O’Connor, Stephen. Orphan Trains: The Story of Charles Loring Brace and the Children He Saved and Failed. Chicago: University of Chicago Press, 2004. Children’s Aid Society of Philadelphia Records and Philadelphia Society for Organizing Charity (later Family Service of Philadelphia), Historical Society of Pennsylvania, 1300 Locust Street, Philadelphia. Philadelphia Society to Protect Children, Records, 1877–1970, Urban Archives, Temple University, Philadelphia. Victor Remer Historical Archives of the Children’s Aid Society, New-York Historical Society Museum and Library, 170 Central Park West, New York, N.Y. Turning Points for Children, 415 S. Fifteenth Street, Philadelphia. School of Social Policy and Practice, University of Pennsylvania, 3701 Locust Walk, Philadelphia.